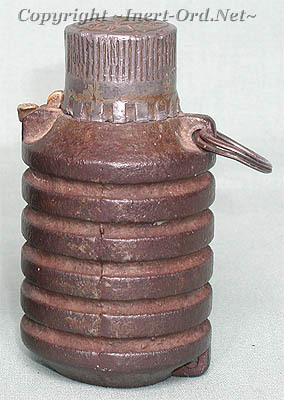 This hand grenade is documented in several U.S. military publications of the period, identified as the Japanese Type 23, or sometimes referred to as simply the Japanese "Pull-Type" grenade. It has a cast iron body which contained an explosive filler of flaked TNT. A simple 5-1/2 second delay fuze was protected by a screw-on lead cover with a thumb released locking catch. To operate, the thumb latch (6) is depressed, and the cap (2) unscrewed exposing a simple pull lanyard (7). A sharp tug on the lanyard draws a friction wire (8) through a match compound (9) which creates a flash over the end of the black powder delay train (4). The fuse would burn for 5-1/2 seconds before igniting the detonator (5) exploding the grenade. Two rings are attached to the body for ease of carry and for anchoring purposes. Confusion often exists among militaria collectors since the embossed "23 Type" (Kanji in the center circle on the cap.) does not fit the usual date / type scheme associated with other Japanese ordnance. Someone familiar with Japanese identification practices of the time might deduce the "23" indicates the Meiji Era. Meiji 23 would be 1867+23=1890 (just before the Sino-Japanese War 1894-1895), but the grenade's design is a bit too advanced for that time period. 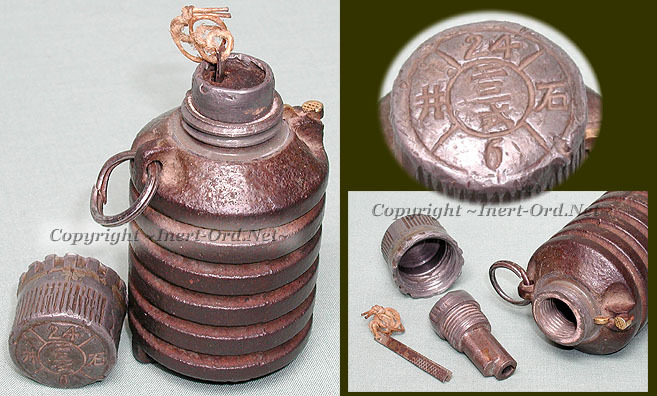 Also, the grenade's appearance and fuze function is quite different from other contemporary Japanese cast iron grenades. It turns out the 23rd Year Grenade is a Chinese deign, adopted by the Nanjing Nationalist government in 1934 (the 23rd year following the 1911 Chinese Revolution). With the start of the second Sino-Japanese War (WWII) heavy fighting with the Russians and Japanese put extreme demands on the limited manufacturing capability available to the Chinese. 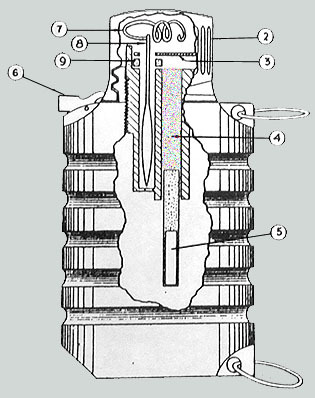 A simple grenade which could be produced in small, less sophisticated machine shops made practical sense. This led to a grenade design using a somewhat obsolete friction igniter rather than a more advanced striker/primer system. That feature, along with simple casting methods and common materials, allowed factories with advanced tooling to focus on weapons requiring more demanding manufacturing technology. When the Japanese advanced south from Manchuria, they captured stores of existing grenades as well as shops that made them. The Japanese used captured grenades to further supply their army and also kept those shops producing grenades for continued use in country, helping the occupying army to be self-sufficient. Today it is generally referred to as a Japanese grenade. There were at least two dozen separate factories known to have manufactured the Type 23, and many of those subcontracted parts to even smaller shops. Apparently many grenades were un-marked except for a paper tag with the Type and date of manufacture printed on them.